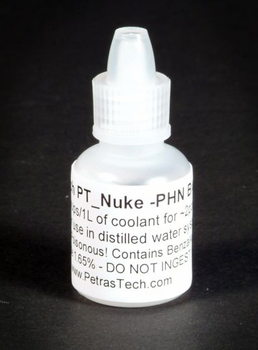 Petra'sTech PT_Nuke-PHN is a specially formulated Benzalkonium chloride solution intended for use as a biocide in your water cooled PC. Primarily geared toward systems running straight distilled water, Nuke -PHN is not acidic and will not drop your coolant's pH, making it ideal for use in poorly buffered coolants and situations where corrosion is a concern (since many corrosion inhibitors are optimized for use within a pH range of 7-8.5). However, we do not recommend the use of Nuke -PHN with most "pre-mixed PC coolants" and dyes (though, our testing indicates that there may be no compatibility issue with Feser's UV dyes). Do not mix Nuke -PHN with the original Copper sulfate based PT Nuke. Warning: This product contains Benzalkonium chloride. DO NOT INGEST! AVOID CONTACT WITH EYES AND SKIN! KEEP OUT OF REACH OF CHILDREN AND PETS! • If ingested, do not induce vomiting. Give plenty of water to drink and seek medical attention. • If contact with skin occurs, rinse with plenty of water. Seek medical attention if pain or irritation persists. • Contact with eyes can result in corneal damage--AVOID CONTACT WITH EYES! If contact with eyes occurs, thoroughly rinse eyes under tepid running water for at least 15 minutes. If sensitivity to light, irritation, pain, or swelling persists, seek medical attention immediately.